A candidates forum on climate change was held on 22 October in Clifton Hill. It featured the four key candidates for the seat of Richmond in the upcoming state election. Richard Wynne (Labor), Kathleen Matzahn (Green), Steve Jolly (independent/Socialist) and Tom McFeely (Liberal). Before we start a summary of what each candidate said, it is important to point out that the true test of climate policy is in whether it addresses what the climate science says is necessary to avoid runaway climate change. This gives a context by which to judge whether a policy is good or not. At this forum only the Greens and Socialist candidates addressed the climate science and showed an understanding of the urgency of the crisis. Richard began by outlining the importance of tackling the climate crisis, and his commitment to this task. He then described current Labor policy. This policy includes a legislated cut in greenhouse gas emissions of 20% by 2020 on 2000 levels (already passed through parliament), a commitment to phase out 25% of Hazelwood within the next term of government and a 5% solar energy target by 2020 on top of the federal 20% by 2020 renewable energy target. While to a lay-person these policies may give the impression that the Labor Party is finally taking the climate crisis seriously, as mentioned above, these policies are nowhere near sufficient to avoid catastrophic climate change – and if the whole world, or if all developed countries copied Labor’s policies, then we would still be facing runaway climate change with all its horrific impacts. There was also very little detail as to how the 20% emissions reductions would be achieved, with what appeared to be a heavy reliance on federal government action. What Richard Wynne also failed to mention, is that the Brumby Government has committed $50 million of our money towards a new coal/gas-fired power station – the HRL Dual-gas proposal. According to a staffer from the Energy Minister’s office, it is this new fossil fuel power station that will replace 25% of Hazelwood, thereby cancelling out the emissions saved. Kathleen began by acknowledging the urgency of the climate crisis and the fact that we only have two electoral cycles to make significant reductions in our emissions. The Greens’ policies include a 40% emissions reduction by 2020 on 1990 levels, a phase out of all coal-fired electricity generation, including replacing all of Hazelwood by 2014 with renewable energy and a significant improvement in public transport. Kathleen acknowledged that these emissions reductions were the very minimum that climate scientists were saying are necessary to give us a chance in avoiding runaway climate change. While this acknowledgment is good, we would like to see the Greens strengthen these policies so as to improve the odds of a safe climate future. There also needs to be far more detail in Greens policies related to how the emissions reductions will be achieved, by which date coal-fired energy will be replaced and what it will be replaced with. Steve started off by discussing the latest climate science, which shows that there is already too much carbon in the atmosphere to avoid runaway climate change, and so we need to go from around 390 parts per million (ppm) of carbon in the atmosphere today, to around 300-325ppm as a matter of urgency (280ppm being pre-industrial levels). This means getting to zero emissions and taking carbon out of the atmosphere. In line with this his policy is for zero emissions by 2020. In the area of electricity generation, he seemed to be using the Zero Carbon Australia Stationary Energy Plan as a basis for how to get to 100% renewable electricity – this plan advocates a roll out of wind and baseload solar thermal, which has been shown to be capable of replacing fossil fuels. He proposed a nationalisation of electricity infrastructure and public transport in order to achieve this transition. Unfortunately there were no further details provided on how zero emissions could be achieved outside the electricity sector. Tom had only very recently been pre-selected to run for the Liberal Party, and although his lack of knowledge of Liberal Party climate policy can be forgiven, what cannot be forgiven is his obvious ignorance of the climate crisis. Tom did not add any value to the forum and was overheard by a YCAN member asking a Liberal Party volunteer what Hazelwood was. It is an insult to the voters of Richmond for the Liberal Party to put forward a candidate that knows so little about the most profound crisis currently facing humanity. We hope he makes an effort to get up to speed on it. We would gladly offer to brief him in order to improve his understanding. Many of us are doing what we can in our homes to cut carbon pollution and save water, and now the government must do its part. Bush fires, floods, sea-level rises and drought — climate change is already harming us all and will get rapidly worse, unless we take urgent action. Denial and delay are dangerous and inexcusable. On Saturday August 21, we urge you to send a message that you want immediate and strong action on climate change. To make your vote count for a safe climate get informed on the different policies of the parties, and pass this information on to family and friends. 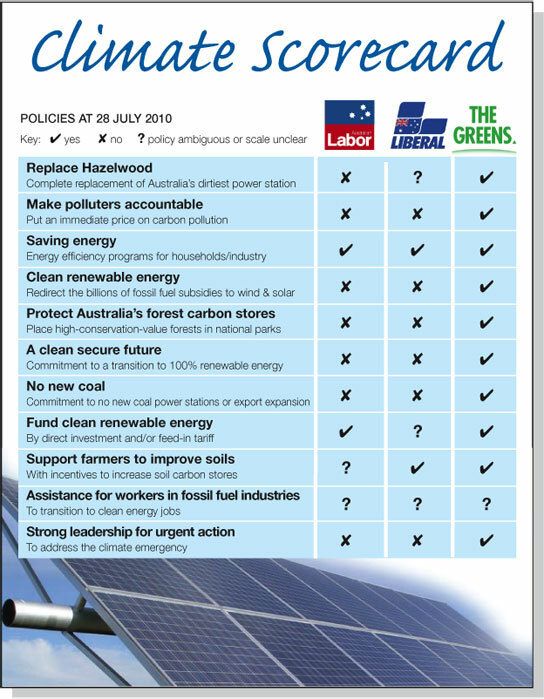 Below is a scorecard put together by a coalition of independent community groups, the full analysis is here (click on the scorecard to see it more clearly). You can also check out a more comprehensive analysis looking at more issues and parties here, or the Australian Youth Climate Coalition scorecard here.